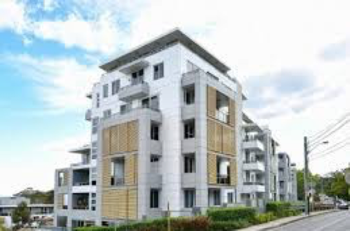 The Strata Manager arranged for an Energy Audit to be conducted on this large 4 tower complex, built in 2006, as it was using over $50,000 p.a of energy in the common areas. The Energy Audit done by Ethan Burns of Sustainability Now, identified that LED lighting, done well, was a major source of energy savings. Tim Etheridge was spotted by the strata company for the effort he put into quoting strata LED lighting projects. Tim was asked to liaise with Ethan Burns to build a proposal. This meant the technical questions were addressed and the quotes used the same light count, to reduce variation in the quotes to price and product performance. The Strata Committee members selected Tim from Proenergy to undertake the large scale project, given the Proenergy price.. 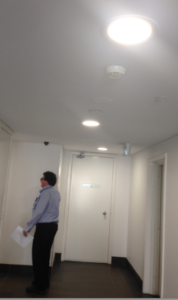 The Lift Lobbies had circular fluoro ceiling Downlights lights, already on motion sensors.. SOLUTION: 12W LED Downlights lights, LED lights do not wear out quickly like CFL lamps, when switched on and off frequently. Fire stairs had traditional twin fluoros, with 80 Emergency type lights, all burning 24/7. LED Emergency lights have a Battery module, costing about $40 every 3-5 years. A Fluoro Emergency light costs about $100 a year, given it is replaced every 3 years or so. SOLUTION: Solid State LED with Radar –microwave sensors on each tube. The fire stairs dim to 30% power until motion is detected. Emergency lights included. The Car park had about 370 fluoro tubes which could be replaced with Dimming linear LED fittings, with sensors that could be optimised to minimise energy but still give excellent light levels. 100 fittings were Emergency type fluorescent, so maintenance savings will be significant on this project. 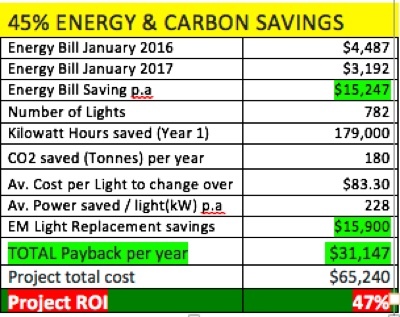 The power bills don’t lie. Below is a summary of the energy saved and the maintenance costs saved on emergency lights. The image at left, shows the 12W LED downlights, on motion sensors. The light levels are excellent and even. direct charges for energy were very low at (av) 8.35 cents per kW/Hour. Adding network charges, the total cost is now 17 cents, up from 13.2 cents per kW/Hour, due the reduction in total demand from 34,007 to 18,810 kW/Hrs per month. This demand charge is now being reviewed, after requests were made to Ausgrid via the retailer, Energy Australia.